464 pages | 37 B/W Illus. The medical humanities have moved into an exciting era of interdisciplinary cross-currents, exchanges and debates that embrace the academic study of medical culture, competing notions of health and illness, public engagement with medicine, contemporary arts taking medical themes as a stimulus for provocative work, and new readings of the more traditional ‘primal scene’ of the doctor-patient relationship. This magisterial new Handbook offers a comprehensive and cutting-edge overview of the state of the medical humanities globally, showing how clinically-oriented medical humanities, the critical study of medicine as a global historical and cultural phenomenon, and medicine as a force for cultural change can intersect and inform each other. 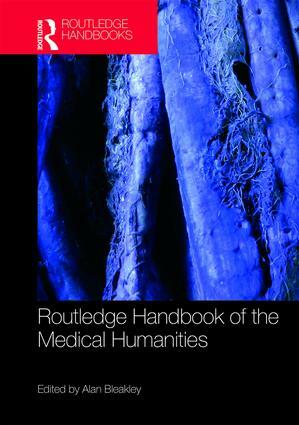 Further developing our sense of what medical humanities can and does encompass, the Routledge Handbook of the Medical Humanities describes how the medical humanities can be put to work in and out of clinical settings, acting as a point of resistance, redistributing medicine’s capital amongst its stakeholders, embracing the complexity of medical instances, shaping medical education, promoting interdisciplinary understandings and recognising an identity for the medical humanities as a network effect. It pays attention to how the arts, humanities and liberal social sciences provide frames of reference that encourage imaginatively about typical clinical issues, such as diagnostic thinking and the consultation, and about wider issues such as the loose way in which descriptors such as ‘health’, ‘wellbeing’, ‘illness’, ‘pathology’ are used, carrying value judgements. At one and the same time, it explores how the clinical encounter, the education of doctors including identity constructions, and the study of medical cultures, could be interlinked for interdisciplinary inquiry. This book is an essential read for all students, scholars and practitioners with an interest in the medical humanities. 14 Medical Slang: Symptom or Solution? 18 Thought Curfew: Empathy’s Endgame? 22 Who is the Audience for Medical/ Health Humanities? 37 Can We Make Empathy More Intelligent? Try Social Empathy! Alan Bleakley is Emeritus Professor of Medical Education and Medical Humanities at the Plymouth University’s Peninsula School of Medicine, and Visiting Scholar at the Wilson Centre, University of Toronto, Canada. He is immediate past president of Association for Medical Humanities Council.